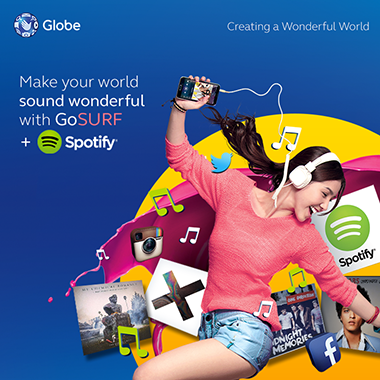 Make your world sound wonderful with GLOBE GoSurf for Postpaid Subscribers where you can visit your favorite sites and apps on your mobile phone anytime you want. Stay updated with the happenings on your favorite social networking sites and get to experience Spotify where you can discover new songs and artists, create your own playlist and stream music all day for FREE! Facebook, Tweet, chat, e-mail and do more with Globe GoSurf an mobile internet plus all the music you want for free with GoSURF and Spotify. With Globe GoSurf for Postpaid Subscribers, you can choose the offer that suits your unique lifestyle.